We’re under 30 days away from Tales of the Cocktail – are you excited? I am – and it doesn’t hurt that the weekend before, Jay from Oh Gosh! and Rick from Kaiser Penguin will be visiting, just in time for my birthday on the 2nd of July. To get ready for this busy, momentous time of year, I’ve decided to try something I’ve been threatening to do for a while and which may prove hard, nay foolhardy to try. Call it training, call it flattery, call it insulting, but I have a goal for the next couple of weeks. 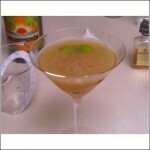 I’m going to post a new drink, made up by me, every day. Each drink will be named by someone who will (hopefully) be at Tales. 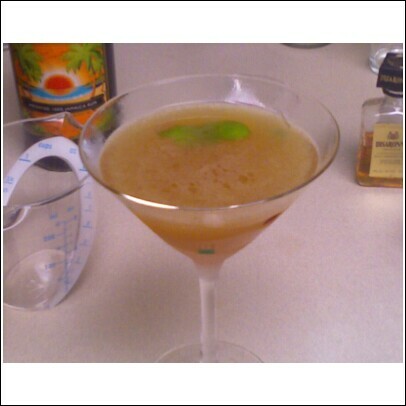 If you’ve got ideas for someone’s drink, you can always e-mail me, catch me in the Mixoloseum chat room if I happen to be in there, or just post in the comments. I’ve got some ideas, and I won’t guarantee the drinks will be great, or even “good”. But I’m going to try. And fi you have a better idea for a drink, post it on your blog! (If you don’t have one, you can always comment here.) When we get to Tales, we’ll make ‘em both and see who likes what better. Sound like fun? I think it does. In fact, we’re going to get this ball rolling right now with the first drink. It was a bit hard for me to come up with this one, as all my mixing stuff is still in the dishwasher, but hey, whatcha gonna do?! Shake with ice, garnish with a slice of lime skin. Well, I’ve tried it, and it’s not bad – so I officially declare this my “Rumdood” cocktail. If you’ve got a problem with it, well, post your own! And we’ll settle it at Tales.